Follow Tour De France And Explore The Entire Country! Watch hundreds of cyclists race through France’s countryside and cliffs next July! Explore one of the biggest cycling events in the entire world this summer! Setting off from the foot of Mont St. Michel, an awe-inspiring medieval church, the race returns to its home shores this year. Last held here in 2013, 1500 riders pedal through the entire French country-side, careening through other neighboring countries as well. A multi-stage competition, bikers will visit Spain, the principality of Andorra, Normandy, and Switzerland. Winding through France’s wine country and breathtaking mountainous regions, seeing the Tour De France is an opportunity for sightseeing all on its own. Hop on board as we take you through the many breathtaking French regions the race takes us through in this week’s blog. Watch Cyclists Pedal All Over Europe! The Tour De France is in action for the entire month of July. With riders speeding through the streets and countrysides of Mont St Michel, Normandy, Pays de la Loire, the uplands of Limousin and Auvergne, the French alps, toward the traditional finish in Paris, it’s sure to get the blood pumping! Bikers start off on the rocky shores of north east France’s Utah Beach, elevate your journey through immense mountainsides, and dismount on the cobblestone streets of the most famous romance city in the world. Imagine the sights and smells you’ll experience by following the Tour De France this summer. Become a Part OF Exciting European Culture! 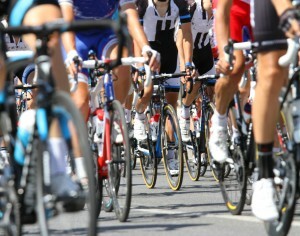 For years, The Tour De France has been a must-see for all Europeans. People line the race’s starting streets days before it begins. Some even camp for weeks, hoping to get the best seats. The bordering crowd is a notable hallmark of Tour De France, which is seen as a nationalistic holiday. Unifying all of France under one sporting event, locals go wild cheering for their competitor. Meet bright, enthusiastic locals to show you what it means to celebrate like a Frenchman. Make lifelong relationships as you follow the tour through beaches, monstrous peaks, treacherous cliffs, and bustling streets. Experience the most famous, exhilarating cycling competition the world has ever seen and make unforgettable, photographic memories while you’re young. Create your own adventure next summer. Just go! Race Away To See The Tour De France With AESU Next July! This entry was posted on Wednesday, June 29th, 2016	at 11:53 am	. You can follow any responses to this entry through the RSS 2.0	feed. Both comments and pings are currently closed.